NOW SOLD NOW SOLD NOW SOLD***HALF ROOSTER RED LEATHER SEATS***FACTORY COLOUR SAT NAV***100% HPI CLEAR*** AA DEALER APPROVED*** Here we have our beautiful top specification Mini Cooper SD Convertible ONLY £30 ROAD TAX, supplied new by BMW/MINI of Wakefield and finished in Eclipse grey metallic, this lovely Convertible Mini Diesel is a true credit to its former keeper as it is in fantastic condition throughout and comes with a Mini service history having last been serviced at 72326 miles.... 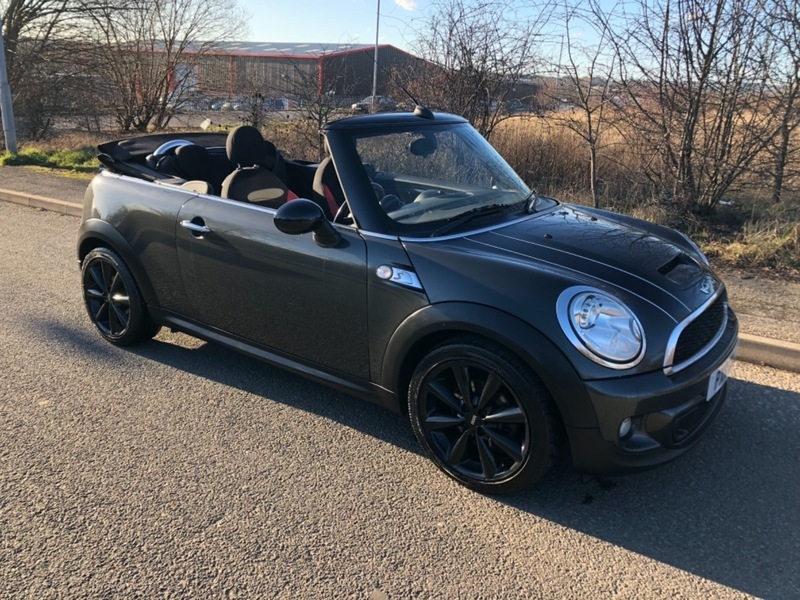 This superb example comes with the following top specification.... 17" carbon black alloy wheels with good tyres all round, half rooster red leather seats, multi-function steering wheel, factory colour sat nav. cruise control, front fog lights, twin exhaust, phone connection, climate control, air-conditioning, on board computer, electric windows, electric door mirrors, start/stop, keyless entry, CD/MP3 player, 3x3 seat belts, folding rear seats, centre arm rests, ISOFix child anchor points, rear parcel shelf, rear parking sensors, remote central locking, 2x keys and original book pack.... This car comes complete with a 12 month mot.... All usual dealer facilities are available. Indoor showroom for bad weather viewing.... As we are an AA approved motor dealer, we offer a free 12 months AA break down cover with every vehicle.... Up to 3 years nationwide vehicle warranty is available... and very competitive finance deals can be arranged. Why not give us a call?